Download "How Equal Pay for Working Women would Reduce Poverty and Grow the American Economy*"
1 IWPR #C411 January 2014 How Equal Pay for Working Women would Reduce Poverty and Grow the American Economy* Heidi Hartmann, Ph.D., Jeffrey Hayes, Ph.D., and Jennifer Clark Persistent earnings inequality for working women translates into lower pay, less family income, and more poverty in families with a working woman, which is of no small consequence to working families. About 71 percent of all mothers in the United States work for pay. 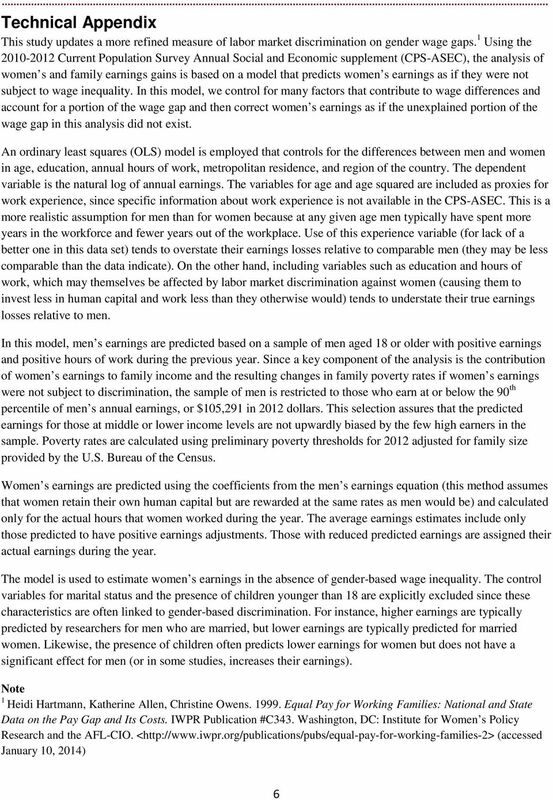 Of these, about two-thirds (68 percent) are married and typically have access to men s incomes, but married women s earnings are nevertheless crucial to family support. One-third (32 percent) are single mothers and often the sole support of their families. And many without children, both single and married, work to support themselves and other family members. 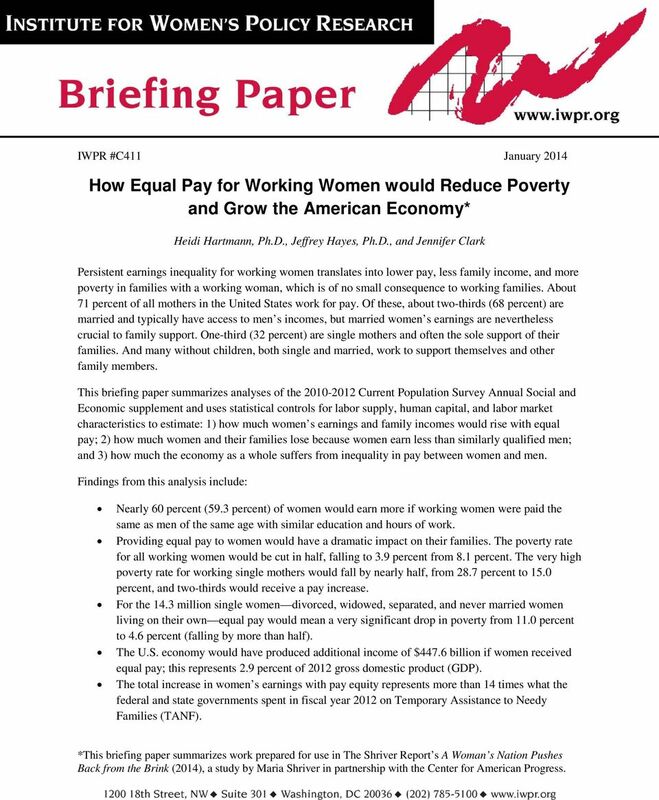 This briefing paper summarizes analyses of the Current Population Survey Annual Social and Economic supplement and uses statistical controls for labor supply, human capital, and labor market characteristics to estimate: 1) how much women s earnings and family incomes would rise with equal pay; 2) how much women and their families lose because women earn less than similarly qualified men; and 3) how much the economy as a whole suffers from inequality in pay between women and men. Findings from this analysis include: Nearly 60 percent (59.3 percent) of women would earn more if working women were paid the same as men of the same age with similar education and hours of work. Providing equal pay to women would have a dramatic impact on their families. 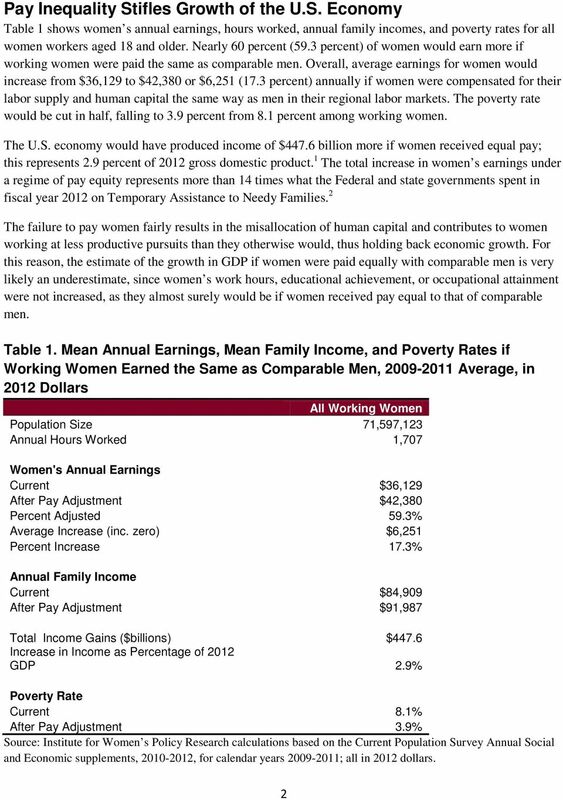 The poverty rate for all working women would be cut in half, falling to 3.9 percent from 8.1 percent. 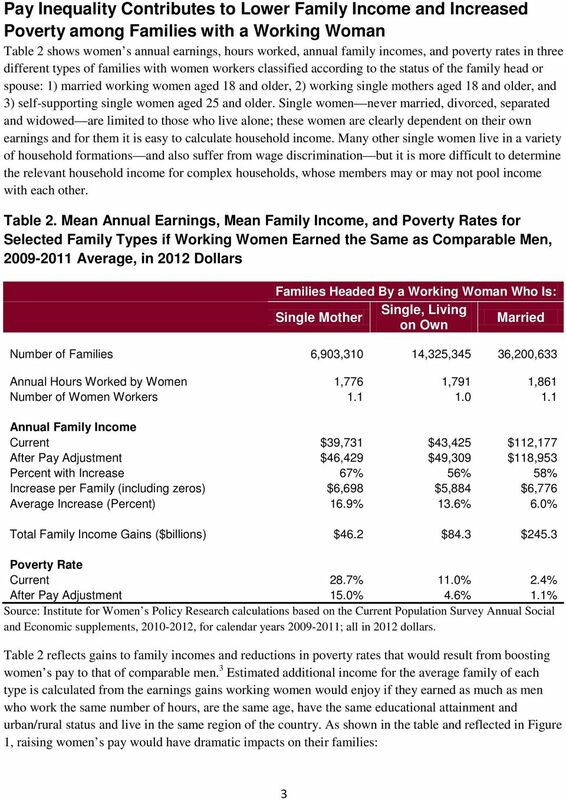 The very high poverty rate for working single mothers would fall by nearly half, from 28.7 percent to 15.0 percent, and two-thirds would receive a pay increase. 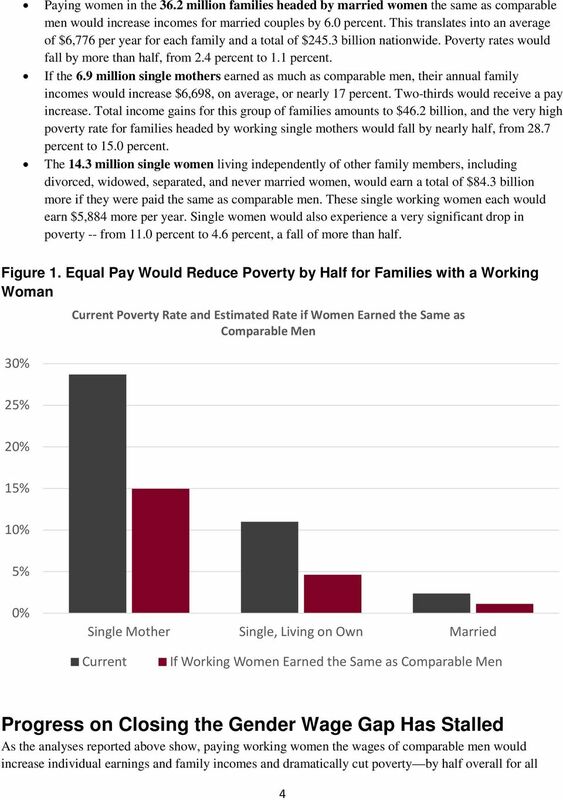 For the 14.3 million single women divorced, widowed, separated, and never married women living on their own equal pay would mean a very significant drop in poverty from 11.0 percent to 4.6 percent (falling by more than half). 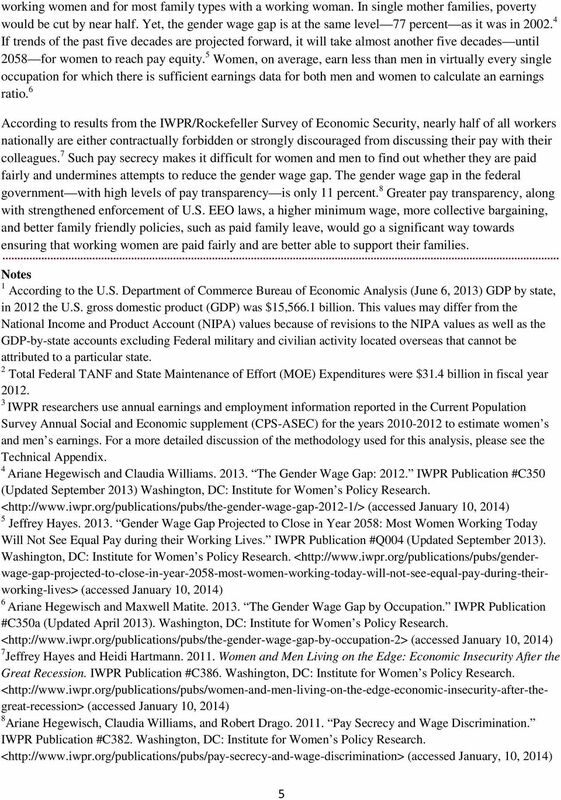 The U.S. economy would have produced additional income of $447.6 billion if women received equal pay; this represents 2.9 percent of 2012 gross domestic product (GDP). The total increase in women s earnings with pay equity represents more than 14 times what the federal and state governments spent in fiscal year 2012 on Temporary Assistance to Needy Families (TANF). 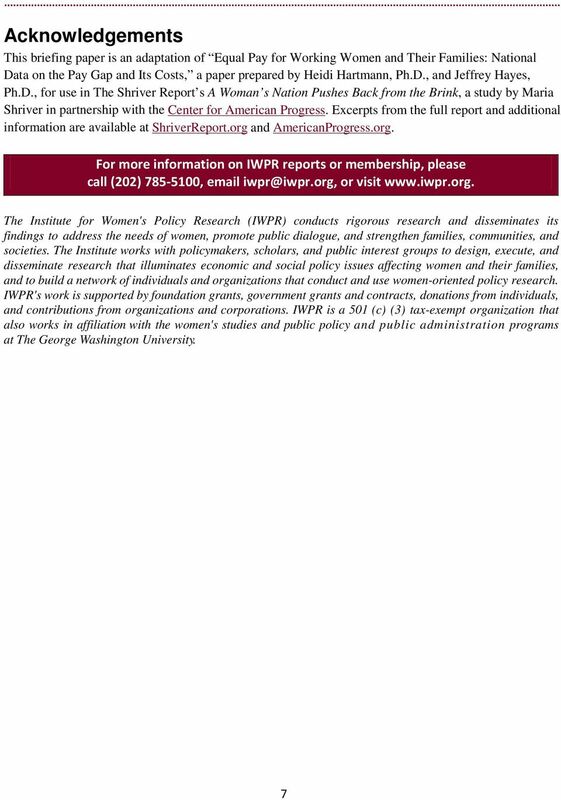 *This briefing paper summarizes work prepared for use in The Shriver Report s A Woman s Nation Pushes Back from the Brink (2014), a study by Maria Shriver in partnership with the Center for American Progress. HAS THE RETURN TO INVESTING IN A COLLEGE EDUCATION DECLINED?